Every year young adults from across the country (and even the world!) make their way to Washington, DC for a summer internship. While DC is rated a top city for entrepreneurship and tech, as an intern it can be tough to meet people from the many dynamic startups in the area. We wanted to change that. At Hatch Apps, one of our core values is to “be helpful”, and to that end we wanted to help startups in DC create great experiences for their interns this summer, and help them build community. We set out to create a space for interns to meet and learn firsthand from leaders in the DC startup ecosystem. Our idea? 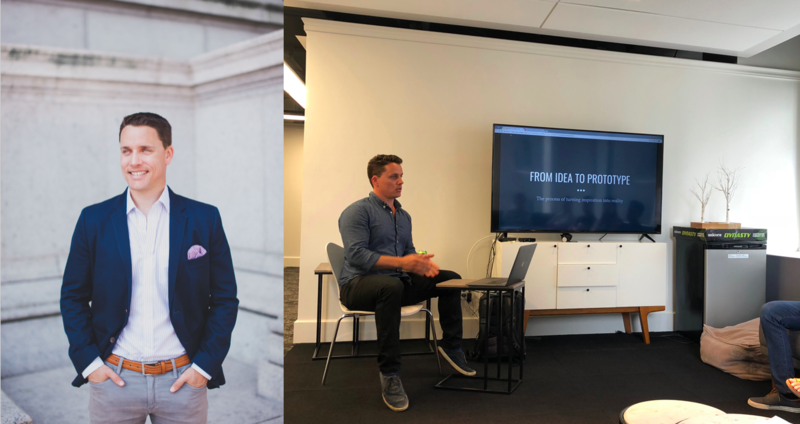 A Lunch & Learn series where each Thursday interns at local startups come to our office to hear from the founder or leader of various local companies. Through these weekly events interns dive into the DC startup scene and get the chance to learn about new ventures, speak directly with company founders, and meet other interns working at high potential businesses. Each week we’ll update this page with information on the incredible speakers who volunteered to connect with and inspire the next generation of DC entrepreneurs and business leaders. For our Lunch & Learn kickoff, Erin Janklow, founder of EntradaESL, came to share her experience as an entrepreneur and talk about the importance of social entrepreneurship. Social entrepreneurship, or creating sustainable ways to solve large social problems, is the philosophy behind Erin’s business: her startup Entrada enables service industry employees to become fully conversational in English in 100 days through a holistic learning system designed for on-the-job learning. “I grew up very aware of the divide socially and economically between people who spoke English and those who didn’t,” Erin said, explaining the history of her idea. After becoming fluent in Italian while teaching English abroad, she imagined a system where the agricultural workers in her community who did not speak English could learn the language while working. Entrada today stems from this idea, partnering with large employers such as the Four Seasons Hotel or Embassy Suites to provide employees with high quality English instruction. As an intern lucky enough to hear Erin speak, I was struck by her incredible humility. Despite being an accomplished entrepreneur and someone whose company is actively changing lives, Erin admitted to often not knowing the answer. “I’m a huge proponent of asking for help,” Erin said, advising us to ask for guidance when we need it. She stressed the importance of finding communities that give resources, something which she has found for herself in the DC tech space and something which she helped build for us interns through this lunch talk. Stay connected with Entrada by following @EntradaESL on Twitter and learn more about the process through this quick video. It’s not everyday you have the chance to meet a 24-year old woman who is a principal at a venture capital firm. But for our second Lunch & Learn event, we were fortunate enough to speak with Katie Kiewel, a principal at 1776 Ventures, a global seed fund. Katie focuses on due diligence, portfolio support, and general fund management. Katie explained that early stage investing is a very hard space for a few reasons. One, companies at this stage generally have just built an MVP and are just starting to generate revenue, which has a much bigger risk profile than later stage investing. Two, at this stage the amount of deals she has to go through is exponentially larger than at other stages, so learning how to spot companies that have “hockey stick” growth potential is key. Three, you are making a huge bet on the team, as we expect the company to learn and pivot many times throughout their journey and knowing most seed companies will fail to raise a Series A.
Katie mentioned that many seed funds are really about second checks. What that means is that many funds invest small checks in a high volume of companies and then follow on into the companies that perform and meet growth milestones. From Katie, we learned about a variety of topics like how SAFE and Convertible Notes work, venture portfolio construction and the typical due diligence process VCs perform. She also shared with us her journey to 1776 Ventures. “I first fell in love with entrepreneurship and the startup space in college and knew I wanted to be surrounded by people who were building the future,” she told us. In her mind, venture capital provided the largest opportunity to learn the most, while being surrounded by incredibly talent people. At 1776 Ventures, Katie has worked with companies in a variety of sectors like fintech, smart cities, transportation, energy, etc. from Seed-to-Series C stage. This has given her an opportunity to have a wide array of knowledge on things like foreign remittance payments to last-mile logistics in Kenya. While building her career, she knew she needed stepping stones to build a skillset where she would be able to create value for a venture firm and their portfolio. Post college, Katie joined The Carlyle Group based in Washington, DC to gain a stronger analytical and financial skillset. 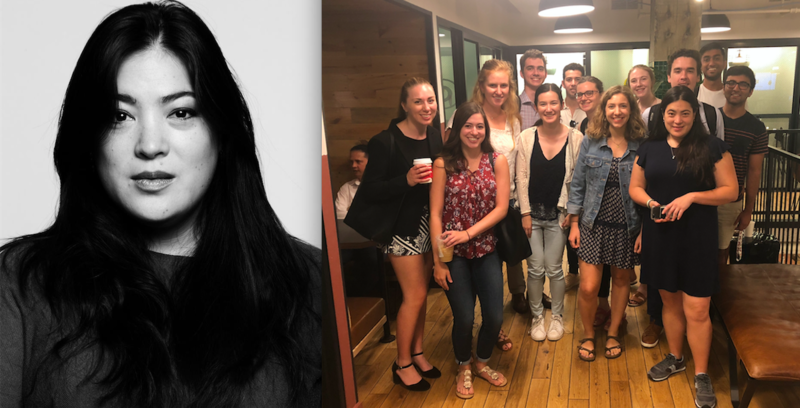 While at The Carlyle Group, Katie had the itch to get more involved in the local tech ecosystem and started going to events at 1776 and when there was an opening on the ventures team she jumped for it! Follow @1776 on Twitter and visit this page soon to hear about more startup leaders who are sharing their time and stories with us this summer. “Sometimes you’ll see a problem in an an industry and think to yourself, I can make it better,” Erik Dreyer told our intern crew this week in his talk on how to take idea from concept to development. This process is something he has first-hand experience with as the co-founder of Goodshuffle, a company building technology for the event rental industry. Erik began his talk by asking us to think about the startups we are working at, and to ask ourselves: What problem does our company solve? This problem, or “pain point”, is where entrepreneurs build solutions. Goodshuffle, for example, answers the call for innovation in the event rental space by providing rental companies with software to track inventory, automate billing, manage sales, and more. They also have an online marketplace where renters can shop and order directly from local rental companies. But the entrepreneurial process doesn’t stop after the idea. Instead, Erik brought us through the practical steps of building a prototype, from doing research to making early no-code prototypes to gathering feedback to optimizing user flows and user experience. Early models of your app shouldn’t be fancy, Erik emphasized, saying that “millions of great ideas have been born by drawing black boxes on a whiteboard.” The key is to make sure your app provides a great user experience. Providing quality user experience (UX) has been a theme in Erik’s career. Prior to Goodshuffle, Erik worked in advertising and software development where he saw the significance of UX in defining a company’s brand. The future of branding, he told us, “is not going to be billboards. It’s not going to be a 30-second advertisement. It’s going to be touch and interaction — it’s experience.” That’s why it’s important to constantly get feedback from customers and iterate, iterate, iterate to create the best product possible. Check out @Goodshuffle on Twitter for more information on how they’re disrupting the event rental space, and visit this page soon to hear about more startup leaders making waves in the DC area. Swamy’s experience in the startup world began at an early age. His first venture? Checking out library books and delivering them to other children via bicycle for a small fee per day. Flash forward to today and Swamy is still innovating and creating novel solutions. Now he’s the co-founder and Chief Technology Officer of Sandboxx, a company that uses technology to connect military communities with their loved ones. A lifetime entrepreneur, Swamy shared with us his experience about how to succeed at a startup. “The biggest quality to have is the ability to morph,” he explained. Though Sandboxx has always been driven to “serve those who serve,” what they offer military families has evolved. By using feedback and being responsive to their customers, their team has designed and improved features that best serve military families. Their most popular service is a letter-writing platform through which loved ones have sent over 1.5 million letters to military recruits and deployed service members worldwide. There was one piece of wisdom Swamy offered that I found especially interesting. As an intern in the startup world, there’s so much emphasis on creating a novel, groundbreaking product, but Swamy told us a common misconception is believing that a cool product is enough. “‘If you build it, they will come’ doesn’t work,” Swamy said simply, reflecting on a time when he and Sam were struggling with slow user growth. But the Sandboxx team was able to break through and reach their customers through innovation and strategic partnerships with the Marine Corps and military academies. Keep up with the incredible impact Sandboxx has on military communities by following @Sandboxx on Twitter, and check back here next week for more info on the startup superstars visiting us this summer. Jay founded MemoryWell in 2016 while caring for her father who, like 5.7 million Americans today, was living with Alzheimer’s disease. She found herself frustrated by the lack of tools to communicate her father’s experience to his staff, so she told her caregivers, “I’m a writer. I think it would be easier for you and easier for me if I wrote his story.” Since then, MemoryWell has grown into a comprehensive digital platform where families can document their loved ones’ lives, and caregivers can better understand their patients. Jay also shared with us the process of writing her book, Broad Influence: How Women are Changing the Way America Works, which explores the point when a minority group begins impacting the conversation, something she witnessed while reporting on the women of the Senate. After hearing about her adventures as a reporter and author, I was curious about how she was able to translate her reporting skills into leading a tech startup. While some of the nitty gritty details of business planning is new, Jay compared doing sales for MemoryWell is to source-building in journalism. Both activities require building confidence through trust and time, and Jay has excelled at both documenting stories and developing a life-changing product. Follow @MemoryWell to see the power of stories to improve patient care, and stop by this page next week for more inspiring entrepreneur stories.